How Does Nicotine Affect the Brain? Diet pills promise a quick-fix for weight loss. Making claims from suppressing your appetite to burning fat, manufacturers list a variety of benefits to spur your curiosity to buy their products. However, it’s important to be aware of just what you are putting into your body. Diet pills or appetite suppressants that contain harmful amphetamines can not only be habit-forming -- they could cause dramatic side effects, including hallucinations. Amphetamines are added to diet pills because they stimulate dopamine levels in your brain. Dopamine is a neurotransmitter associated with happiness and improving your attention span. Because dopamine may be released after you enjoy a meal, diet pills attempt to create false feelings of satiety in your body. This can have the effect of temporarily reducing your appetite, and you may experience a feeling of euphoria, or a “high,” when taking amphetamine-containing pills. In addition to decreasing appetite, amphetamine-containing diet pills have some short-term effects on the body. These effects include increasing your heart rate and blood pressure. Amphetamines speed the nervous system, which makes you feel more alert. If you have been fatigued, amphetamines can reduce feelings of tiredness. You also may observe that your pupils are dilated. Because amphetamines contained within diet pills create a high, they also create a low when you stop using them. Over time, your body becomes accustomed to the effects of amphetamine dosage, and you may feel the need to increase your dosage to imitate your original high. While weight loss can be one of the long-term effects of amphetamine-containing diet pills, you also may experience symptoms such as insomnia, restlessness and tremors from coming on and off the medication. Amphetamines also can cause changes to your behavior and mind. You can have symptoms of paranoid psychosis, where you feel as if people are watching you or out to get you. You also may have hallucinations of being in different places and times. People taking amphetamines long term also may exhibit violent or aggressive behavior. If you experience these symptoms, discontinue use of your diet pills. The United States Food & Drug Administration has banned most amphetamine-containing diet pills because they are addictive and can cause harmful side effects. However, there is a class of appetite suppressants that contain compounds similar to amphetamines. 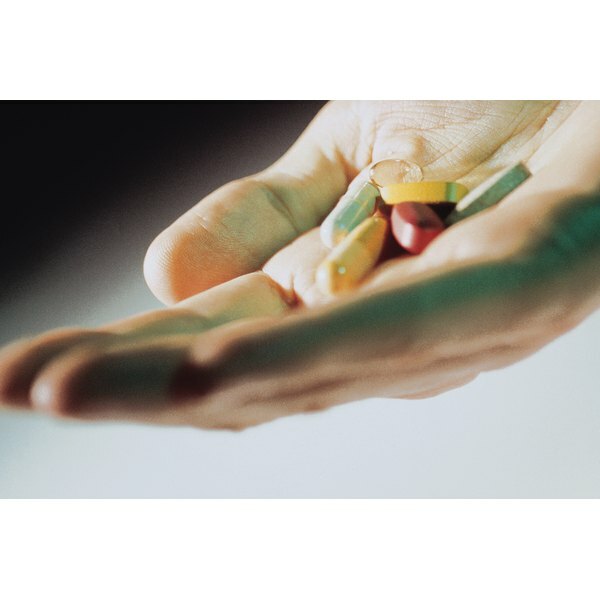 Called anorectics, their ingredients have similar effects to amphetamines, but are available on the market either with or without a prescription, depending on the particular compounds involved. Read appetite suppressant labels for ingredients such as phenylpropanolamine, an anorectic available over the counter. You may wish to consult your physician or pharmacist about your appetite suppressant to ensure it does not contain anorectic-like compounds. How Do Drugs Affect the Human Brain? What Are the Dangers of Sharpie Markers?